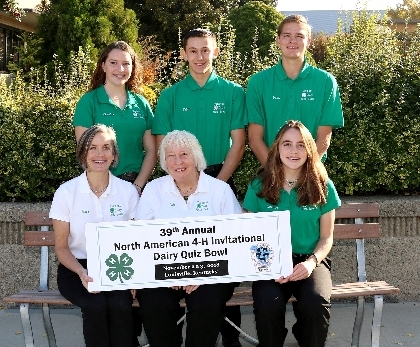 Burlington--For the four 4-H'ers representing Vermont at the recent North American 4-H Invitational Dairy Quiz Bowl, their third-place win was a sweet victory. This is the first time since 1987 that the state team has finished in the top three. Coming in first and second, respectively, were teams from New York and Wisconsin. Seventeen teams from throughout the U.S. participated in this year's competition, which took place Nov. 2-3 at the Kentucky Fair and Exposition Center in Louisville, Kentucky. Representing University of Vermont (UVM) Extension 4-H were Caroline Kirby, East Montpelier; Calvin Seward and Dana Seward, both from East Wallingford; and Chandra Stanley, Franklin. The team competed against Minnesota, Illinois (twice), Wisconsin (twice) and Iowa for a total of six rounds of questions in the double-elimination competition. For their third-place finish they were presented with rosette ribbons, commemorative milk glasses and engraved silver cups at the awards banquet. Caroline Kirby also was recognized at the banquet for placing second highest overall on the 50-question written exam that each competitor completed the evening prior to the buzzer rounds. She received a framed certificate as did each of the other top ten high individual scorers. The scores from the written exam were used to rank the teams for the quiz bowl contest as well as to determine overall team standings. Questions for the buzzer rounds covered a wide range of topics, among these, feeds and feeding, herd health, dairy nutrition, breeding and genetics, calf raising, dairy foods and marketing. For this year's contest, the featured topic was lameness in cattle and its treatment and prevention. Each round consisted of five group questions where team members could discuss and collaborate on answers and 20 toss-up questions where points were awarded to the first individual to buzz in the correct answer. Bonus questions, each worth up to 20 points, were offered to a team when three members of that team answered a question correctly. The 4-H'ers had an opportunity to socialize with the other competitors at a pizza party. Accompanying the team were their coaches Sara Kirby, East Montpelier, and Judy Vaughan, Newbury. Each team member received a K. Stewart Gibson Award, given in honor of the former UVM Extension dairy specialist, to help cover expenses with additional financial assistance from the State 4-H Dairy Committee. To learn more about the 4-H dairy program, contact Wendy Sorrell, UVM Extension 4-H livestock educator, at (802) 651-8343, ext. 513.